Wes Sargent is a 3D lead animator at "Rainmaker Animation & Visual Effects" studios, the studio where are produced a large number of special effects on Stargate SG-1, Stargate Atlantis and a lot of shows and movies such Dark Angel, Smallville, Dead Like Me, Firstwave, Andromeda ... He has worked on the conception of the Atlantis City (Stargate Atlantis), the Stargates, the Puddle Jumper, several Wraith ships, the Seberus, and much more. Some of his works are so detailed that you can't even see them on your screen! 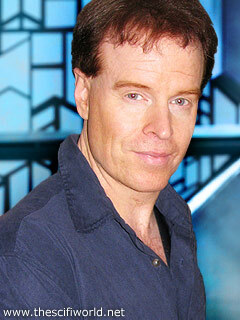 He has worked with Bruce Woloshyn since the early years of Stargate. His contribution to the Stargate visual universe is Huge! Gilles Nuytens: How did you start in 3D modeling? Wes Sargent: My FX work really began with the desire to eat something more than craft dinner. I was always interested in effects from a very young age. A kid from Vancouver, B.C. seemed very far removed from all the Star Wars action in Hollywood. So being in a position to do the fun stuff really didn't happen until the advent of the personal computer. In the early to mid 90's, CG software that was being used professionally had just started to become affordable. After a couple of career hiccups, it seemed like falling back on artistic talents was a viable endeavor. I did some research, purchased what I needed and began learning at home. There are some great schools out there, but for me the prospect of paying multiple thousands to graduate with little more than a video tape seemed risky. I wrote a short science fiction script and from there set about to create shots. The process forced me to problem solve with a larger story in mind, just like in the real world of production. Once I had a collection of things I thought I could show, I went looking for work. I contacted several FX houses, one in particular helped produce one of my favorite shows. I offered to create their website, do interviews, anything just so I could learn how it all worked from the inside. They were very good to me, answered my questions and challenged me to push the envelope. I'm amazed how much time they spent with me, in fact. I've always been very, very thankful. Every place I sought work from told me I had to be able to produce shots that were as good as those already on TV. Hmmm, that seemed rather daunting. All I had was a 486 pc and very little work experience. So the next thing I did was try to study and recreate various FX scenes from shows already on TV. I've seen artists do that with work we've done here and it is quite flattering. Imitation is a great way to learn. I'd encourage everyone starting out to give it a try. From there I landed a few jobs and finally ended up doing Stargate SG-1 on more of a regular basis. Gilles Nuytens: Who or what influenced your works, your design sense and your motivations of making space stuff? Wes Sargent: There are many good artists on SG-1 and Atlantis at Rainmaker. I think everyone here inspires each other, including what is produced by other vendors. As an example, I learned from friends who did Space Above and Beyond, if the sun is coming from a certain direction and it looks good in one shot, but not in another, cheat it around a bit so that every shot will look as good. That's not always possible. Sometimes you can see glaring errors between shots if your not consistent. For example, something that happens often is where you start out lighting a planet from one side and then in the next shot you have a reverse angle. The light would look better going the other way in the second shot but your locked in so it usually has to be one way or the other. As a rule of thumb though, whenever possible, light to make something look great within the limitations you are presented with. And if there is some strange mysterious bright light that's making your ship look pretty good but no one is sure where its coming from, well then I say be thankful for the off-screen moons. The same goes for designs. A script or real world physics often presents you with certain restrictions. You can't just create whatever you like, it has to serve the story and suspend some measure of disbelief. But if you can get away with little cheats here and there to make something look more appealing, then you try and slip it in....much like aliens who funny enough, all know how to speak perfect English every time. Aside from people we work with, films and shows like Space: 1999, Alien, Star Wars, and 2001 still inspire me. That whole gang from the seventies which included people like Martin Bower, Brian Johnson, Giger, Syd Mead and the like caught my attention. When it comes to cool ships and designs, those were the masters in my opinion. The ships had character, the designs interesting from virtually any angle. With physical models, I don't think it costs that much more to gak up a ship (adding all the little widget details) compared to digital ships. In CG, the computer has to calculate every little shape. So what you can get away with in the real world as far as complex gak can become challenging in ours depending on the processor power and memory considerations of course. But then again, we have benefits real world model makers don't have. We can blow up the same ship without really destroying it, or clone it a thousand times over at the touch of a button. Stargate SG-1 and Atlantis has had it's own look. But in a universe with countless alien civilizations, there seems to be room for lots choices. If we have the chance to make some piece of tech look really detailed, I try to do it and usually we get a favorable response. If you stand on the shoulders of someone greater than yourself, you can sometimes see a bit further down a road. So it is in this business. If we learn to do it better, it's usually because we learn from each other and build on those who've gone before. Gilles Nuytens: What are your favorite models from Stargate, the favorite that you built and the favorite made by another artists? Wes Sargent: There have been many. I enjoyed building the Seberus, the Goa'uld Mothership, The Tartarus outpost, both Gates for the two series. One of my first jobs on SG-1 was detailing an existing Goa'uld Mothership for "Pretense". Joe Cruz lit it rather dark so we could get away with allot but I always wanted to go back and redo the entire ship. It was originally a Maya model that we ported over to LightWave and it needed a fair bit of clean up back then. I got the chance to rebuild from scratch with the SG-1 episode "Orpheus". You'll notice that the pyramid in the center is larger than other Motherships. James Robbins did some nice production art work where the pyramid was at least 50% bigger than what was in previous episodes. I went back and forth between his scaled up version and what we'd seen before. His sizing made those particular shots look much more interesting so everyone decided to go with that. The Daedalus has some very sweet detail for a CG model. That artist did a great job and we all enjoy using it in shots. Marc Roth created the first Stargate puddle effect used here and later Tom Brydon carried on his legacy producing a gazillion shots and tweaking it further. Extremely talented artists who I think deserve awards for the most used effect ever. Marc later went on to create other amazing water in the final Matrix movie. Gilles Nuytens: How long did it take you to build the Puddle Jumper? Wes Sargent: I think about 6 or 7 weeks in total. There were a couple of trips back and forth to the studio to get pictures and measurements. The studio model differs a little from ours but I'm pretty happy with it overall. The Puddle Jumper seems like a simple ship to create because it's basically a cylinder, but the paneling was the more complex aspect. I like to put bevels on most edges to reduce the hard edged cg look. Depending on the shape it can all be very time consuming. It pays off in the end when you get a nice glint from a light or softer looking shadows. I think the PJ holds up well in the close-ups, something that can be more of a difficulty in the larger scale vessels where you start off wide and fly into a small section of deck plating. Some of the fun in building the Puddle Jumper was in the finer details. The original production sketches gave us a starting point for how the engines should look. It was a little bit of a problem to figure out how to make them retract into the body where there really was not a whole lot of space. If you watch the animation close, you'll see that there's a little back and forth retraction going on before the engine compartment finally closes, similar to what happens on huge aircraft cargo doors where they stutter a bit before they seal shut. Adding people to the interior was something that came later. Originally we had the actors mapped on planes and placed inside the cockpit. I did a shot in Stargate: Atlantis "Trinity" where the PJ emerges from the gate and that's where we first see full 3D characters whose arms, torsos and heads actually move. When there is time, there's always things we do that no one asks you for that will sweeten up a shot. That's satisfying, and it makes our clients happy when we can give them more bang for their buck. Gilles Nuytens: Prior to Stargate, what have you done? Wes Sargent: Beginning in the 3rd season, Stargate SG-1 was one of the first shows I worked on. Before that was a job called Wizards Realm that I don't think ever got off the ground, The Crow 3 where I built a lamp post....and hey don't laugh, I got a whopping 400 bucks for that, US too, lol. I worked on other independent projects where I just lent a hand or did spec work. Gilles Nuytens: Outside of Stargate, what was your favorite show/movie you worked for and why? Wes Sargent: That's a tough question. They were all good for the most part. When I think of shows outside Stargate I think of the people I really enjoyed working with. Dark Angel comes to mind because of Elan Soltes who supervised. He also did the pilot for Smallville. Elan is a terrific fellow to work for. Very easy going, hard working, believed in the artists, always seemed accessible, on task and consequently led the way to a couple of Emmy nominations for us. Brushing shoulders with people like David Nutter or indirectly with James Cameron was a treat. Gary Gutierrez on The Lizzie McGuire Movie and Adam Buckner on Andromeda was fantastic. Everyone wanted the shows to look as cool as they could within the limitations we had and they were great guys so you have fond memories. Then there are the artists and staff you've worked with on a daily basis, many SG-1 people like Bruce Woloshyn, Gary Poole, Tom Brydon, Rod Bland, Simon Ager, Debora Dunphy, Nick Boughen, Dan Mayer, Jose Burgos, Christopher Stewart, Lee Pierce, Amanda Schiemann, Naomi Stopa, and new additions like Judy Shane, Mark Stewart, and Justin Gladden. Apart from the SG-1 crew and producers we work for, these are all folks that I know personally have worked very hard and made significant contributions to the show. Gilles Nuytens: What was your part on the movie "I, Robot", the TV shows "Dark Angel", "Andromeda", "First Wave", "Smallville" and "Dead Like Me"? Wes Sargent: For I, Robot I began working on the final version of robot that demolishes that big house. Originally it was started by Daniel Osaki in Maya and I began rebuilding it and rigging it in LightWave, adding all those nice bevels and details and things like that. Halfway through, I was called back into service for the pilot of Atlantis so I had to leave the model in the hands of two other great artists, Les Quinn and Craig Calvert. I was sad to see it go, but they did a wonderful job. On Dark Angel, Trevor Cawood and Neill Blomkamp started building the Seattle Space Needle and I was brought into to help. After we did the Pilot, they moved on to other things and I became the lead CG artist for the series. So there was various kinds of shots that I had the privilege of working on. I think most if not all the flyby's of the Space Needle I ended up doing. When we started needle shots we used motion control. That was a very long process. By the end of the last season, we were solving our tracking issues and adding additional camera moves in five to fifteen minutes. Motion control was eliminated completely. 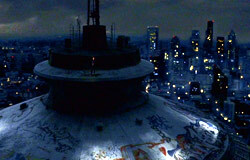 For Smallville I did various shots and then built Clark's escape pod. That was an interesting story in itself that we'll leave for another time. But as I recall, there was just over a week to come up with a look and construct the final version. I think it worked okay as a little one man craft. In Dead Like Me I built a proscenium for the opening sequence. Bob Habros, the supervisor was a cool guy to work for too. I worked on Andromeda for the first couple of seasons. There were quite a number of shots. Like Stargate, too many to list but there were some favorite highlights. I would say the Banshee Fighter which was based on a design, I believe by Tom Tennisco. Big guns, and big engines, lots of fire action, big fun. The rear Andromeda Bay was my baby. We did a sequence where we had a Than fighter being pulled in on a cable and I built just a floor and some lights. It went over well and we were asked to expand on it more for another episode. It became another example of that Star Warsey kind of look. I think everyone liked it and I was happy to see it used as a reoccurring stock shot. I was proud of the Genite ship sequences. Proud we survived it because we had very few working days considering what got built. Bruce Woloshyn and I put in some insane hours. I recall building much of the main ship over the Christmas holidays. Jim Finn, the FX supervisor came in one day and said we want a craft that looks like a triangle. Make something up. Jim gave us allot of liberties, so your mind would always go, cool, and you go crazy with ideas and gak. When it came to the final composite where Bruce is adding all the lasers and pyro, its sort of like Christmas again and you don't want to leave to go home. Obviously now you look back and I wish I would have built this better or that, but for its time I think it did well. I also built this maintenance robot that I got a kick out of. It was only was a few pixels high in an actual episode so no one really got to see it, but I liked that allot. It was tech but it also was a character. Gilles Nuytens: Do you have a favorite software? Wes Sargent: We use all kinds of software here, basically whatever we need now. But LightWave is my program of choice for 3D. It's ideal for quick turnarounds. It's powerful and a has a fantastic renderer. Photoshop, well that's just a given. Gilles Nuytens: Your favorite scenes/shots? Wes Sargent: There were so many. When you're working on something new, often that becomes a favorite. 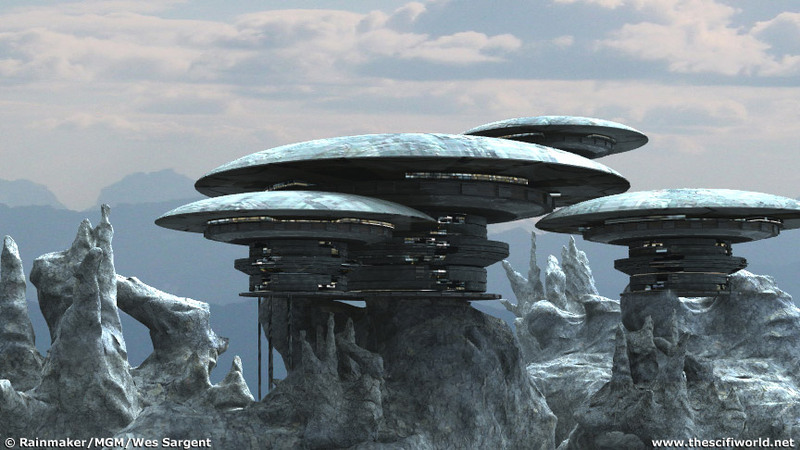 But looking back I think the Tartarus Outpost from SG-1 "Evolution Part 2" was in the top 10. I was able to construct this complete 3D exterior environment and interior and Bruce Woloshyn tarted it up with cool... pardon me, smokin' hot lava effects and all sorts of other stuff that made it sing. We did a sequence in "No Man's Land" where the Orion and the Daedalus are attacking some Wraith Hives. That turned out rather well I thought. I liked doing the Puddle Jumper hitting the ocean bottom in "Grace Under Pressure", the Lava planet in "Lost City" was a favorite too. I did some initial tests flying over the landscape in the day and a couple of people were asking me if it was real footage. They were probably just being nice, lol, but it the kind of work environment that makes your job pleasurable. Gilles Nuytens: Which shots and models are you the most proud of and which ones do you think could have been done better? Wes Sargent: All the models could have been done better. It's a matter of time mostly, then money and experience. As the years go by, I look back on stuff that was created in earlier days and sometimes I shudder. But as an artist, you're always improving, computers get faster which allow you to do more than you could before. That being said, as efficiency increases, there's often less time in the budget to complete something. I can't count the number of times I said, "wouldn't it be cool if ...". There's also story point boundaries you must work within and design philosophies I like to keep. 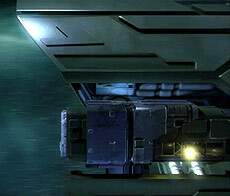 With a spaceship for example, the key is to make it look good from every conceivable angle. That isn't always possible, but that's what you shoot for. I think the Wraith ships might have been improved. We have a few versions, each with their own strengths and weaknesses. The Hive ship in particular is a massive ship. The closer you get to it, the more the detail needs to hold up so it gets tweaked as time goes by in every version we use. But I like doing shots with those ships and lighting them to look their best. The original Hive had a different look, more like a two pronged fork. We were in the process of delivering our final shots for "Letters from Pegasus" when we got notes that said we needed to make it more symmetrical. So in the space of an hour, we made a huge change. I lopped off the left side completely and mirrored the right side over. Funny enough, in the opening credits there is a shot of the original flying overhead. So in the end it was neat to see both versions on the screen. Gilles Nuytens: Isn't that frustrating to sometimes have to do something that isn't as good as you could do it because of the time schedule? Wes Sargent: Always. Time is constantly a factor no matter what. As much as you try to keep emotionally detached from work, because this is a commercial industry where someone else pays for a product they want, if you spend many hours and invest energy in a certain direction, it can feel a little frustrating sometimes if a design gets tossed and you really believe in it. But then again, part of the job is to make something look great given any direction. So I try to look at it as something that will stretch you as an artist, provoke you to think differently. That can be a win win situation for everyone. All depends how you look at it. We might get a production drawing and for whatever reason, once we get it into a 3D environment we find we might have to alter it. Same goes for the compositors, we could create something we think works great, and then by the time it gets into their hands, it might have a completely different look . . . and from there, a supervisor or one of the producers or directors on the show might have yet another take on it. So there is a process and channels to go through like any organization. But I must say, I've enjoyed the opportunities over the years to have allot of freedom to create things for both series, whether its bringing your design to life or someone else's. 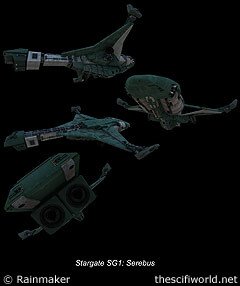 The Seberus was a ship I really liked in "Forsaken" . . . well all except the nose which lacked the detail, but we really didn't get to see it much. It was totally built to fit within the limitations of what was shot on location, so much of it was hidden from view. 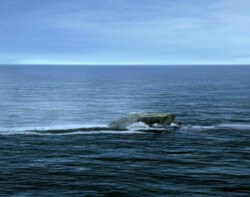 Bruce Woloshyn, again, created some amazing water effects for the take off. That was impressive. Another facility took what we did and made their own version for the episode "Space Race" and the look changed somewhat. Gilles Nuytens: What you can realistically create on a TV time line? Wes Sargent: The time a shot or build takes really depends on it's complexity. In some cases we might have a couple of months to put something together, but that is very rare. If we do we're usually working on a bunch of other shots at the same time. Most often we'll have only days. If it's a complex model that is going to be used over and over again, we tend to have more time because they can amortize the costs over the course of the series. Gilles Nuytens: The time to finish the special effects on an episode can vary from one to another, which episode was the longest and which one was the fastest to complete? Wes Sargent: More often than not, you always end up spending more time than you thought on something. You can't go too crazy because there is a budget to follow and limited amounts of time as mentioned, but we try to push the envelope as much as we can and give our clients more than what they expected. I think the pilot episode for Atlantis was the longest. We had to build everything from scratch. There's allot of back and forth with producers and different iterations of things. Everyone wants to get it right because you're going to be seeing many of these assets (models) or effects over and over again throughout the course of the series. The shortest episode I can't say, probably the one with the least number of effects. From CG, there was a series of shots where we didn't have allot of time and we had to construct a satellite. So I created a very low poly 3D version for the long shots and then doctored up some photographs for the detailed close up. I put them on cards and moved them by camera. It worked surprisingly well I thought. Gilles Nuytens: How long does it take for you to complete a matte painting of a planet or nebula? Could you explain the process and maybe giving us some tips? Wes Sargent: Tips, yes. With planets and nebulas, go big or go home, especially in high definition. Nebula's tend to be more of the matte painting variety that we map on geometry. I've used a variety of techniques over the years to build planets. I can't give away all our secrets, but I will say they are for the most part, all 3D and they are built to look good from a distance or fairly close up. Obviously, the finer the detail, the more computer memory you may need. If you want to build a good looking planet, look at lots of NASA photography and start with that. Planets are one of my favorite things to do. Gilles Nuytens: You probably have a lot of designs that never made it to the screen, can you talk about the history of those designs and maybe show us some samples? Wes Sargent: Many of the designs that never get fleshed out are only a sketch somewhere on a napkin. Yes I do save them. Some are nearly finished models....and then there's every stage in between. On a TV budget we can't afford too much waste, but it's nice when you have a little bit of time and freedom to explore options. Here's a preliminary look for the Tartarus Outpost which you can compare against the version that made it in the show, and a 5 minute concept sketch for Thor's new Chariot. All crude starting points but you'll get the idea. There was a gate fighter that was never asked for, but I built in my spare time. It was an Earth based spaceship/submersible plane with retractable wings that initially fit through the Stargate. The reaction I got around our shop was that it was very cool, but I don't think there was ever an opportunity show it much less use it. It had since evolved to the size of a small bomber, so it no longer fits, but things like that you still keep on tap for another day. Gilles Nuytens: How do you set about to build something? Wes Sargent: You have to know the context, what the story requirements are. When you know the range you have to work within, then you can go nuts. With a spaceship, I like to start with the nose or the front of the ship. Like a face on a human being, it's usually going to draw the most attention. If I can, I like to make a quick sketch, really rough, and then from that, scan it into the computer and build a low resolution version. I spin it around in 3D and see how it looks from all angles and then modify the design accordingly. Gilles Nuytens: Are there some stories about some shots, models that could be fun or interesting for us to know about? Wes Sargent: Ha Ha, if you only knew. There are so many. I wonder if we taped the conversations if they would sell on ebay? Just kidding. I like my job too much. Gilles Nuytens: Do you watch Stargate SG-1 and Atlantis? Do you have a favorite episode/story? Wes Sargent: I usually watch a cut or two of an episode before we start our work so I can figure out what I need to do within the show. Most everyone who works on Atlantis or Stargate is encouraged to do that. Its a great thing really because often one person will catch something that maybe several others have missed. So we all work as a team. I really enjoyed the writing in Atlantis's "Grace Under Pressure". That was a favorite and I liked doing the underwater puddle jumper shots. Gilles Nuytens: How do you feel about the cancellation of Stargate SG-1? And how do you feel about the fan's rally to save the show? Wes Sargent: Stargate SG-1 had a great run. As a fan you want to see your show live on indefinitely. But things change. It's hard to imagine any series going on forever, but I don't think the fan's rally to save it is a lost cause. If there is enough interest, anything is possible. Look at Star Trek. I don't think the SG-1 universe is dead by any means. I believe Stargate was the most watched sci-fi show in the world. And Atlantis is a fantastic spin off in my opinion. So whatever happens next, I think there's an exciting future still ahead. What inspired the Snowflake - design of Atlantis? Wes Sargent: We did start to build in the winter months . . . could that have anything to do with it? I began helping with the model construction near the end. Quite honestly I'm not sure where that initial design came from but it ended up looking pretty good don't ya think? Gilles Nuytens: For shots coming up to the command level (Balcony) was the interior model or was that left to the live action to be put in place for when looking into the command level? Wes Sargent: Those interiors are live action photography. Gilles Nuytens: How many people do you have working on a 3D scene, for example the Aurora fly by a planet. Is it just one guy, doing all modeling, texturing, etc. Or are these tasks divided among several artists? Wes Sargent: Depends on the complexity of a scene, what is required and how much time we have. It's not unusual for one person to handle a flyby. It's typically the norm. For the 1st season of Atlantis I was fortunate enough to do most of the space stuff while other artists concentrated on the enormous city, landscapes, ocean builds and other effects. Now that's just the CG department where we do 3D work. There are also our compositing artists who seat the CG in the live action photography, add their own elements and massage and tweak everything to make shots look polished. Last season Dan Mayer and Jose Burgos, who were two of our key artists, each designed some shots, lit them, animated them and did all most of the compositing work themselves. Not bad I'd say. Gilles Nuytens: Could you give us any approximation of the real-world dimensions for the models. In other words, can you tell us how big they are supposed to be? Wes Sargent: I can't give you the specific details, especial since there are so many, but I can say that the Wraith Mothership seems to be the largest space vehicle we see on a regular basis ... to my knowledge anyway. The Atlantis city seconds that. Gilles Nuytens: Do you have some traditional art experience? Wes Sargent: I never had any real formal art training no, although I did work as a television camera man for several years. I did drawing, painting, model making . . . all the creative things you might do as a kid I brought with me. I would spend countless hours drawing spaceships, creatures, and things from my favorite sci-fi shows. Or I'd draw whatever you might see in the real world: people, animals, cars, buildings, abstract stuff, mix it up and maybe as you're lost in thought, you'd come up with a story to explain it all. I will say, every little drawing I've tried to keep. Maybe it's the pack rat in me, but you never know when you'll be searching for some inspiration. The sketch you did when you were seven might be just what you need in a crunch. When I was younger, some would come along and tell me I was wasting my time with all this fantasy stuff. I don't consider myself a great artist by any means, but I'm happy to have fun at my job and get paid for it. I believe God allows people talents to explore and develop. Sometimes its best, if you can still pay the bills, to just go where your interests take you. There's always going to be nay sayers. So when a young person, any age comes to me to show me his sketch book or other creation, I take him very seriously. That work, those ideas could be significant stepping stones in his future. Art, whether in music, on a canvas or on a TV screen, can help inspire and shape beautiful visions of a world yet to unfold. 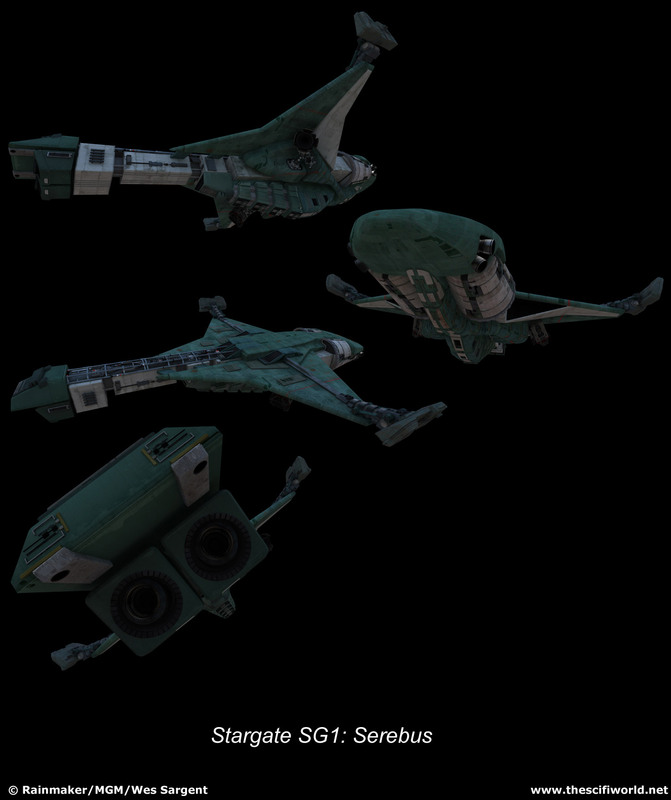 Gilles Nuytens: Is it possible to have orthographic renders of some Stargate ships you have build? Wes Sargent: I'm really sorry to say I can't. But keep watching the show and checking the magazines. I suspect there's going to be more ships and more shots where you can check things out in greater detail. 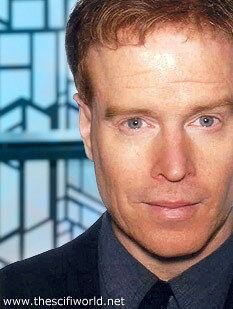 You can now ask your questions directly to Wes Sargent on the forum! 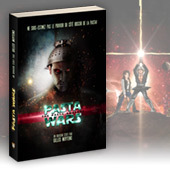 Interview by Gilles Nuytens for The Scifi World.